Paddle board fishing also called “Man of fish” or extreme fishing has been around for as long as surfing has. Initially, it was conducted on long boards, paddled out to the fishing hole in a prone position. 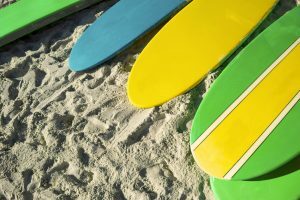 Although a long board would do the task, the boards were not designed to stand on when not on a wave. Regardless, adventurous surfers with a knack for fishing made due. Now, with the invention of paddle boards, the game has completely changed. 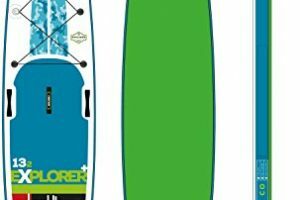 The current paddle boards are stable, wider, and specially designed for kneeling or standing on the entire trip. With the vast availability of SUPs, paddle board fishing has become very familiar. Today, I would like to recommend you a few spots that must visit if you are a true paddle board fishing ‘s fan! Depending on where you reside, there are many destinations you can do paddle board fishing if you look around. However, if you are obsessed with fishing on your paddle board, there are unique and stunning spots that you must visit. Leave casinos behind and escape to the Colorado River located just outside Las Vegas for a paddle boarding adventure. Paddle boarding offers you a new perspective of Black Canyon, a 600-foot gorge where the Hoover Dam was built. Also, do not miss exploring the hot springs and hidden caves along the river. If you happen to visit Las Vegas, you might think that the only place to take a dip in your hotel pool. Well, Black Canyon is a secret side that most Las Vegas visitors ought to know about it. The region is load with dramatic desert landscapes, some impressive hot springs, and narrow slot canyons. All the water available in this area provides a natural habitat for marine life. Due to this, you are likely to be spoilt for choices when doing paddle board fishing in this fascinating part of the world. Some types of fish you are likely to catch here include walleye, catfish, black crappie, largemouth bass, rainbow trout, and striped bass. However, there is a few regulation that you should follow. These rules apply between the Black Canyon of the Gunnison National Park boundary and the closure at Crystal Dam. You should only use artificial flies or lures. Each Rainbow trout caught must be released. Must have a Colorado fishing license. It is illegal to fish within 200 yards downstream of Crystal Dam. You can visit the official website of National Park Service to learn more about it. When it comes to paddle board fishing, few places in the world can compare to the Bahamas. Fishing in this area is a paddle boarder’s dream, and people from all over the world come to come to engage in the sport. Abundant of fish in the waters of Bahamas starts in Bimini, located 50 miles east of the Florida coast. The strip ends at the Southernmost Island, Inagua, located on the Caribbean’s northern edge. Another incredible place to do paddle board fishing in the Bahamas is Grand Bahama. It is the northern most island of the Bahamian chain. This island is widely known for great saltwater fishing and bonefish filled flats. 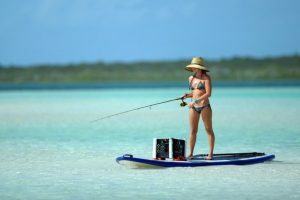 Other islands in the Bahamas that are good spots for paddle board fishing include The Abacos, Andros, Nassau, Eleuthera, and Paradise Islands. All the stated places have a wide variety of fish species. Some common ones include Blackfin Tuna, Bonefish, Broadbill, Dorado, Kingfish, Mackerel, Sailfish, Oceanic Bonito, Snapper, and much more. This Atlantic Ocean’s coral-based archipelago will melt your heart for its super impressive scenery. Paddle boarding began with the “Beach Boys of Waikiki” in the 1960s. They used to paddle out on their long boards while taking pictures of tourists learning to surf. Laird Hamilton, a surf pioneer, popularized the sport in the late 1990s, making it the fastest growing watersport in the United States. Hawaii is widely known for its laid back lifestyle and beautiful beaches. Although the place is well known for surfing, its islands are growing into the world’s best SUP locations. Due to this, paddle board fishing has become quite common in this region. 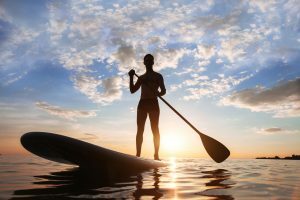 You can do this activity in a destination like Ala Moana, Keauhou Bay, Kealakekua Bay, Sunset Beach, Pua’ena Point Beach Park, and “Pops” or Popular in Waikiki. In these destinations, you can find a variety of fish like Yellowfin Tuna, Skipjack Tuna, Sailfish, Blue Marlin, Striped Marlin, and much more. Well, it’s a perfect spot to paddle board fishing while you are on your honeymoon. It seems like every direction you look in Seattle has water. From Green Lake to Puget Sound to Elliot Bay to Lake Washington, there isn’t shortage of water bodies to explore on your paddleboard. Forget to tour Seattle on foot, paddle boarding along Seattle’s waterways offers you a chance to see the city’s unique and fascinating views that line the coastline. Some of the right places to do paddle board fishing in Seattle include Lake Union, Sunset Hill Ballard, Eastlake, and Salmon Bay. All these destinations have a lot of marine life, making them ideal for paddle board fishing. Coho Salmon and King Salmon are the most targeted sports fish in Puget Sound. However, there are times when fishing Salmon is not allowed in these areas. At this period, fishers focus on fishing bottom fish like Flounder or Lingcod. Other types of fish in these parts include Goldfish, Grass Carp, Tui Chub, Common Carp, Chinook salmon, pink salmon, and Golden Trout. It is still worth it tho. Paddle boarding went on to create a splash on California’s surfing scene. Paddle boarding does not require waves, and its popularity is made possible by how easy it is to learn on flat water. Well, the calm water in Santa Barbara Harbor offers one of the best and most popular spots for paddle board fishing and paddle boarding in general. At Santa Barbara, you have a great chance to view fish, seals, and possibly dolphins that swim next to you as you paddle. This abundance of marine life offers a great spot for paddle board fishing. Some types of fish that you can catch here include rockfish, greenlings, cabezon, California Scorpion fish, California Sheephead, spiny dogfish, flatfish, starry flounder, California halibut and much more. During summer in this ski town, there is nothing better compared to paddling on the crystal-clear water of Lake Tahoe while viewing the snow-capped Sierra Nevada Mountains. Moreover, there is no scarcity of Lake Tahoe coastline for you to tour. You can even paddle across the California-Nevada state line from Crystal Bay in Incline Village, Nevada to North Shore Kings Beach. 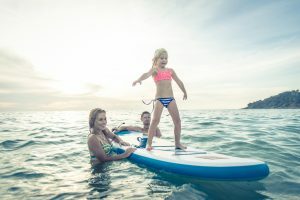 If you visit Lake Tahoe during the summer, you can enjoy a lot of paddle board fishing and when free, jump into the warm 70-degree waters and lay on many beaches. In Lake Tahoe, there are four major fish species. They include Brown Trout, Lake Trout, Kokanee Salmon, and Rainbows. Other less common types of fish include Tahoe sucker, Catfish, Largemouth bass, Bluegill, Speckled Dace, Paiute sculpin, and Tui Chub. The south of the border of Puerto Vallarta is a perfect place for paddle boarders of all levels. At this place, you have a chance to glide along the calm water in Banderas Bay and also soak up the seascapes of this incredible Pacific haven. You need to keep an eye out for humpback whales, dolphins, and sea turtles that usually inhabit this area. Puerto Vallarta is an ideal place for paddle board fishing mainly due to its wide variety of marine life. Therefore, you have a chance to experience the 86-degree water and the incredible scenery. If you decide to do paddle board fishing in this waters, you have an opportunity to catch different fish species available here such as Grouper, Amber Jack, Mahi Mahi, Black Marlin, Jack Crevalle, Pargo, Red Snapper, Rooster Fish, Sailfish, Wahoo, Tuna, Mackerel, and much more. 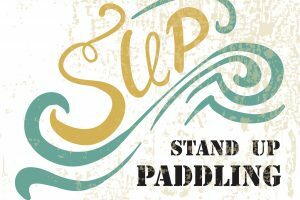 The relaxed nature of SUP fits perfectly with the laid back attitude of Key West. At Key West, you have a chance to take in natural beauty as you paddle board along the mangrove forests. As you do this, watch out for abundant marine life – from manatees to stingrays – in this protected and diverse ecosystem. Key West has numerous areas accessible to paddle board fishers, most of these being state parks. However, there are many options such as the Atlantic and Gulf sides of Key West. These destinations are home to numerous types of game fish like Permit, Tarpon, Snook, Snapper, and Redfish. These factors make Key West a great place for paddle board fishing. While Costa Rica is known more for surfing, paddle boarding is building momentum here quite fast. Here, the sport is familiar with tourists that don’t want to spend a vacation learning how to catch a wave. One of the country’s best spot for SUP is Playa Danta, located in Guanacaste region. With air and water temperatures levitating around 85 degrees all year round, you will not mind falling off your board once in a while. Costa Rica is rich in marine life and paddle board fishing can be conducted in the Gulfo Dulce off the Osa Peninsula and Peninsula Papagayo in Guanacaste. These two places are protected from the wild waters of the Pacific. Additionally, you will have a chance to see some underwater gems. If you are an experienced paddle boarder, you can go ahead to the south of Nicoya Peninsula and Tamarindo. You can also paddle board on Lake Arenal below the Arenal Volcano. All the stated destinations have different varieties of fish, making them ideal for paddle board fishing. Some fish types that you might catch here include Snapper, Wahoo, Marlin, Dorado, Yellow fin Tuna, Roosterfish, and Snook. The beautiful town of Whistler has not met a sport it didn’t like. Therefore, when the snow melts off ski slopes, outdoor lovers here pick up a summer sport like paddle boarding. You can enjoy this incredible game in brilliant-blue lakes such as Alpha Lake and Alta Lake. With the background of the Canadian Rocky Mountains, paddle boarding is a superb way to take in all the stunning beauty of Sea to Sky Country. An incredible way to get onto the water, relax, and enjoy the breeze is to try your hand at fishing, and the Lake Alta is the perfect place to conduct it. Tourists and locals have been flocking Alta Lake for its abundant stocks of Cutthroat Trout, Dolly Varden Char, and Rainbow. Catch-and-release fishing is essential for conservation purposes. With over fifteen different species of fish in Whistler, fishing is an ideal activity to do all year round. Nevertheless, if you aren’t interested in the fishery for Rainbow Trout or Chinook, summer is a good time to get out and enjoy the lakes and rivers. Florida Bay is part of Everglades National Park and is a real wilderness. 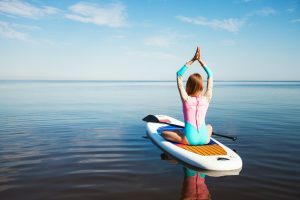 When it comes to paddle boarding, there are very many options for you. You can decide to do a short paddle or a long one to the last 100-mile through the Everglades to Everglades City. Throughout Everglades National Park, there are several designated areas, also called Chickees, which need a permit from a ranger station to access. You can also decide to camp at the Flamingo Visitors Center. Whatever place you choose, you are guaranteed of an unforgettable experience. In this area, fishing is on another level with Tarpon, Redfish, Bonefish, Snapper, Permit, and Snook being the most targeted species in the mangroves or the grass flats. As you fish, you will have a chance to view a wide variety of birds, the beautiful scenery, and if lucky, an American Crocodile. Wekiva River is a sixteen-mile-long spring fed river that originates from Wekiva Springs and is a very short drive from Orlando. The primary focus for paddle board fishers is Largemouth Bass. However, there are other great options such as Sunshine Bass, Redbreasted Sunfish, shell crackers and even Stripers. For these other options, you will have to go down the river closer to the confluence of Wekiva and St. Johns rivers. The initial few miles of the river will have clear water that will enable you to sight your targeted fish species. Despite the fact that this part of the river is most scenic, it is harder to catch fish here due to water clarity and heavy paddle traffic. Paddle boarding further downstream will allow you to catch more fish straight off your paddle board. Destin also called Choctawhatchee Bay has a diverse fish variety from the tannin stained water at Hogtown Bayou to emerald coloured waters around East Pass. 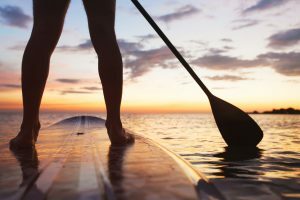 There is straight forward access on all sides of Choctawhatchee Bay, making this area a great destination for paddle boarders. One of the main reasons Destin is number 13 on our top spots for paddle board fishing. You can found Redfish and Fantastic Trout along the shorelines in the bay. However, most fish will be found around grassy patches on docks, oyster bars, flats, and any river mouths that empty into the gulf. Other types of fish that you will find here include Black Drum, Flounder, Pompano, Striper, and the Spanish Mackerel. Close to Miami airport is the Blue Lagoon Lake, a superb place to catch Peacock Bass. Butterfly Peacock Bass were initially from the Amazon until their introduction to South Florida in the 1980s. From then henceforth, they have become a common game fish due to their intense fights and aggressive feeding habits. Antonio Maceo Park offers an outstanding paddle board fishing spot as it is the only launch spot for the Blue Lagoon. Undertake paddle boarding along the shorelines looking for structure, and you will certainly find fish. Apart from the Peacocks, you can also catch Jack Crevalle, Tarpon, and Largemouth Bass in the Blue Lagoon. Jacksonville has many great fishing spots. However, we are going to look at one particular region that is easy to access and very efficient for fishing. This area is called Heckscher Drive and is between Amelia Island State Park and Jacksonville Zoo. Heckscher Drive is located in the Northern part of St. Johns River and has plenty of both private and public ramps. The numerous creeks that branch off St. Johns along Hecksher protect large vessels and the wind. This area offers a home to a wide variety of marine life such as Black Drum, Flounder, Redfish, Sheepshead, and Spotted Seatrout. 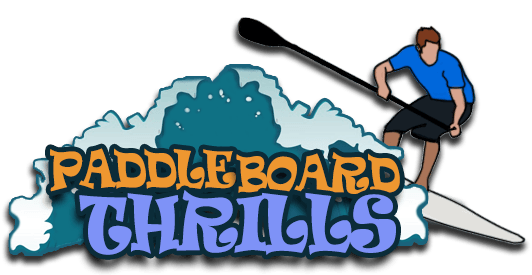 Paddleboard fishing is an incredible activity that has become quite common of late. However, since it requires particular conditions, there are unique places where the activity needs to be conducted. Some of these spots include Black Canyon, Hawaii, Bahamas, Lake Tahoe, Santa Barbara, Florida Bay, and many others. All the mentioned destinations have the right conditions and are abundant in fish, making them ideal spots for paddle board fishing. Not only that, it also offers you another great activity to do. Therefore, if you would like to enjoy catching fish on a paddle board, the aforementioned are destinations you must visit. If you know any other secret spot, let us know in the comment! Need more fishing advice, check out reelsaltwaterfishing.com.